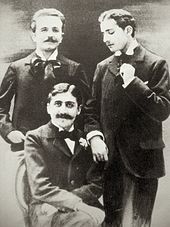 Beginning in 1895 Proust spent several years reading Thomas Carlyle, Ralph Waldo Emerson, and John Ruskin. Through this reading he refined his theories of art and the role of the artist in society. Also, in Time Regained Proust's universal protagonist recalls having translated Ruskin's Sesame and Lilies. The artist's responsibility is to confront the appearance of nature, deduce its essence and retell or explain that essence in the work of art. Ruskin's view of artistic production was central to this conception, and Ruskin's work was so important to Proust that he claimed to know "by heart" several of Ruskin's books, including The Seven Lamps of Architecture, The Bible of Amiens, and Praeterita.